If you are a working magician, making a VIP magically appear for a show or event will be a common request. If you are a corporate Event Magician, the most popular request will be to make the CEO magically appear. Wedding magicians will often be asked if they can make the bride, groom or couple appear on stage. Even birthday party magicians are asked if they can make the birthday child appear from nowhere. Half the time, the logistics will just not allow for such an appearance to be performed. However, if you can make a VIP appear for an event, you can charge a premium fee for this illusion. You should easily be able to charge an extra 25% – 50% of your show fee (on top of your show fee) to execute this illusion. As a commercial performer, it might be a good idea to research how this can be done so that you can be ready to stage this (and charge for it) when the opportunity arises. There are a number of standard props and methods that can be used to produce the VIP. A ‘Tip-over Trunk’, ‘Flash Appearance’, ‘Book of Life’, ‘Stack of Boxes’, ‘Mummy Wrap Switch’ Three Way Screen’, ‘Bryce’s Screen’, ‘Modern Cabinet’, ‘Giant Square Circle’ and ‘Backstage with the Magician’ are common favourites. You can also talk to a professional illusion builder to see what can be built for you based on your budget and needs. Most professional large-scale magicians or illusionists typically would have at least one of these illusions in their arsenal to make a layman appear. The VIP does not have time to rehearse complicated sequences. Even if he/ she has the time, there is no guarantee that he/ she can remember an illusion sequence if it is complicated. Try to avoid giving them anything to do, other than a mere step forward – you or your assistants/dancers should do all other work. 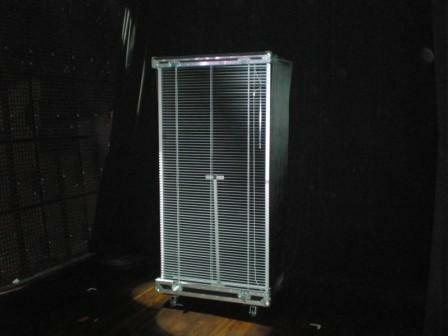 Your staging conditions are limited and you may not always have an ample backstage or onstage area to stage the illusion using large props. You also may not always have a backstage area to load the VIP in a secret hiding space. The prop or method used should match the theme of the event. If you are staging the illusion for a safari-themed carnival, a modern industrial looking prop will not fit the event. Try to ‘pad’ up the appearance illusion at the start with a dance or magic sequence. Besides building anticipation and excitement to the illusion, it also extends the overall presentation of the illusion and clients feel that the illusion is more worth it if it is longer. The biggest challenge is finding a balance between the simplicity of the method for the VIP and still ensuring that the illusion is spectacular and deceptive. Not only that, the cost of staging the illusion generally has to be kept to a modest budget. I share a very simple appearance that can performed without any large props in the Backstage Section of this website. Over the years, I have made dozens or VIPs, celebrities and executives appear on stage. I don’t have one method to make a person appear, I have at least 10 methods and have used them all at one time or another. I have used “standard” props such as the “Tip Over Trunk” and a traditional “Flash Appearance”. I have also developed many different appearances out of necessity due to fit into an event space or to fit a stage set design. Two talents transform into the CEO appears with my “Ghost Cabinet” (from ‘Illusionary Departures’) designed to look like a dressing room. 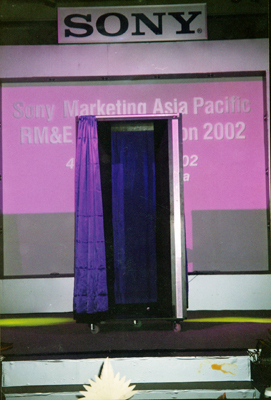 Several times, I have been asked to make a VIP appear but the client/ show producer did not want a “box” on stage. This led me to design a practical person appearance called “Backdoor Appearance” designed specifically for VIPs at corporate & special events. 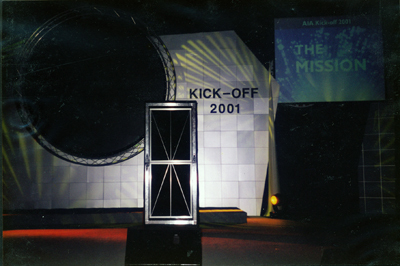 The workings of this illusion are integrated into the event backdrop design so there are no “props” per say except for an open-frame platform. This design can be found in my illusion book, ‘Illusionary Departures’. 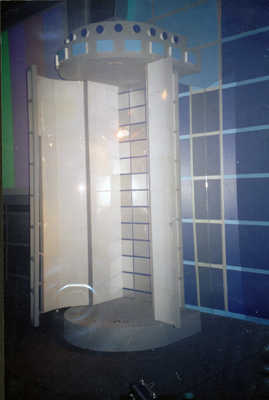 An advanced “Backdoor Appearance” using an appearance chamber using the “Million Dollar” principle. For something that packs flat and is easy to perform, “VIP Trunk” is easy to build and easy for the VIP to perform. The benefit of this illusion is that it packs flat and is not a huge prop. It is a great alternative to a “Tip Over Trunk” and is detailed in my book “Urban Illusions”. These two illusions (and a third “Simple VIP Appearance” are also available as an illusion design package “VIP Appearances“. My latest illusion design “The Arrival” is described in my book Corporate Illusions Made Easy. It is a large prop but can break down. However, it is very impressive but simple to build and can be presented very effectively with video animations projected onto the prop. I also designed a self-contained appearance illusion called “Flash Blinded’ – The Worker’s Appearance Illusion System“, specifically for the Event Magician. I used this for a number of years, especially when I was traveling to different countries for a corporate road show. If the event environment, logistics or budget does not allow you to stage the VIP appearance, suggest that he perform an illusion or escape, just not an appearance. Many times, the event organizers would just like the VIP to be highlighted on stage in some way or sometimes the VIP has an ego and insists on being part of stage program. In that case, offer to teach the VIP to perform a self-contained stage effect, illusion or escape. If appropriate, he could also produce items relevant to the event from a production box like a square circle, mirror box or drawer box. The idea is for the VIP to perform the magic and have you facilitate or assist. Technically, you might be executing the magic techniques but the VIP gets the credit… just like how illusionists and assistants work. A simple shackle escape makes the VIP looks good and is interesting for the audience. I created an escape illusion called ‘Corporate Restraint’ (from Corporate Illusions Made Easy) where the VIP instantly escapes from a set of shackles and a sack tied tight, held by his employees. While this is not an appearance, it is a powerful effect that does the job. You are only limited by your creativity and general magic knowledge but the single takeaway is to remember that you can offer alternatives to a client who want their VIP to appear on stage.